Despite many claims as to the top road speed of a Main Battle Tank, such as the Abram’s and Leopard 2 reaching 72km/h, it’s the most irrelevant of all mobility characteristics. Tanks are huge gas guzzling giants, and despite their resistance to explosive attacks, have many fragile parts that prove susceptible fatigue. Its not only the vehicle who suffer from this, but the crews too. Constant monitoring of sighting equipment, vibrations, confined spaces and noise over a long distance can be exhausting. Therefore its essential to transport these giants from bases or points of delivery to the frontline/battle zone and as such you need giant transporters with attitude, to not only save fuel, damage to the tank, but also the crew, so that both arrive fresh and up for the fight at the frontline. Other than Germany, Italy is the only country to manufacturer the Leopard 1 (under Licence). Originally accepting 200 A2’s in 1971 (order completed in 1972) Italian manufacturer OTO Melara built 400 for the Italian Army. 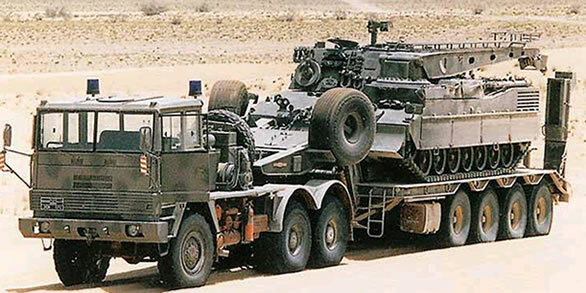 This set a requirement for a new tank transporter with prototypes being built in the late 1970’s and thanks to the requirement that it could transport vehicles up to 60 tonne, its capable of transporting the newer Italian developed C1 Ariete MBT now in service with the Italian Army. The Italian IVECO 320.45 Tank Transporter comprises a forward tractor engine developed and manufactured by IVECO and a trailer developed by Bartoletti. The vehicle is manned by a driver and has accommodation for 3 of the 4 tank crew members. For loading and unloading two 20 tone capacity winches are located behind the cab. For use over sandy terrain a special sand version is produced with single 14.00 x 24 tyres on the front axle and single 24.00 x 20.5 tyres on the rear axles; the kerb weight of this version is reduced to 14.7 t.
Optional equipment includes a six-man cab, a towing hook for standard trailers, an auxiliary fuel tank, a front-mounted self-recovery winch and a fording kit for water obstacles up to 1.2 meters deep.